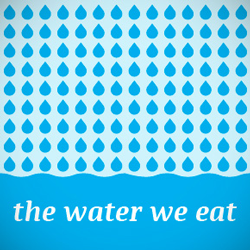 When farms face water shortages, our food is at stake. The current California drought—one of the most severe on record—is everybody’s concern, and farmers and eaters alike can be part of the solution! Food is thirsty. The average person eats as much as 1,320 gallons of virtual water every day. Virtual water is the water it takes to produce the food we eat. About 80% of the state’s developed water is used for agriculture (excluding “environmental” water that remains in waterways). But food is life, so rather than quit eating, we can do our part to save water and support the farmers who are working hard to keep us fed in a time of drought. 1. Talk to your farmer. Growing practices significantly impact water use. Ask your farmer about how they use water on their farm, and buy from farms that use water-saving techniques, such as going organic, composting, installing drip irrigation, and using mulch. 2. Know your water footprint. Water use varies widely from crop to crop. Orchard crops tend to use more water per pound than annual fruit and vegetable crops, because of the years it takes to nurture trees to fruit-bearing age, and because they must be watered year-round for only one annual harvest. Animal products (especially those that are grain-fed rather than pasture-raised) tend to require much more water than plant products, because of the water that goes into producing the feed the animals eat throughout their lifetimes. Water is only one factor in the sustainability of our food, but it’s an important one to consider. 3. Waste not. About 40 percent of the food produced in the United States is never eaten. When food is wasted, the virtual water used to grow it is thrown out too. Reducing food waste is easy: Plan ahead, buy only what you need, get creative with leftovers, and eat the whole plant or animal when possible. And don’t let misshapen produce go to waste. Embracing cosmetically challenged but perfectly edible produce is another way you can combat the drought. 4. Eat more plants. It takes a lot of water to produce meat, especially beef; you could take 6 months of showers with the water used to produce one pound of beef! Americans eat more meat than our bodies require. Consider choosing smaller portions of meat and increasing the plant-based portion of your plate, or going meatless once a week. 5. Buy organic produce and pasture-raised meat. Overall, organically grown crops use less water than conventionally grown crops. Organically managed croplands tend to have more organic matter in the soil, which increases water holding capacity and reduces water runoff. When you buy animal proteins, opt for pasture-raised meat (especially unirrigated pasture), which requires less water than conventional, grain-fed meat. 6. Eat drought-tolerant foods and grow them in your garden. Seek out varieties that don’t drink much. Armenian cucumbers, orach, lambsquarters, chard, okra, some varieties of eggplant, and amaranth are just a few of the crops you can find in the farmers market that do well in a drought. Mother Earth News has a good list. 7. Seek out dry-farmed foods. The ancient technique of dry farming, or cultivating crops with little or no irrigation, is extremely relevant in these dry times. Not all crops are suitable for dry farming, but at the Ferry Plaza Farmers Market, Devoto Gardens & Orchards dry-farms apples, Little Organic Farm offers potatoes, Dirty Girl Produce and Lonely Mountain Farm have tomatoes, and Iacopi Farms grows some of their beans without irrigation. Wine grapes and olives can also be dry farmed in California. Dry-farmed produce is often more flavor-dense than conventionally grown produce, but the yields are lower, so it can be more expensive. 8. Avoid processed food. In addition to the virtual water used to grow food, food processing takes water (and often wastes some of the food). The amount of wastewater associated with processing produce ranges from an average of 1,600 gallons per ton of tomatoes to 17,000 gallons per ton of cauliflower. 9. Be a water-wise gardener. When you grow your own food, you’re in control of its water footprint. Many gardeners make the mistake of over-watering. For tips, check the San Francisco Public Utilities Commission’s online Water-Wise Gardening Guide. 10. Be a water-wise cook. Minimize water used for boiling, and use it for plants afterwards. Be efficient when washing dishes and produce. Avoid the garbage disposal. Visit the CUESA Food Shed in the south driveway at the Ferry Plaza Farmers Market on Saturdays to learn more about the drought and food.